I noticed there wasn't anything recent around that does this kind of thing - so I made one! The choices will be displayed on the last message in the message array. - Added history of all messages, Moan.history. - Removed arbitrary 3 option limit, now "infinite"
- Cleaned up the Global namespace, a lot. Last edited by milk on Wed Nov 01, 2017 5:08 am, edited 29 times in total. Last edited by milk on Fri Jul 14, 2017 1:40 am, edited 1 time in total. It does work, you just need to use a font that actually has the characters you want to display. This library looks really interesting. Do you remember the dialog boxes in Grandia 1? Sadly it might feel playful, but lacks the expressions of images. I always was hoping to find something like this with images in a game. Maybe you are interested in enhancing this lib to allow such a speech bubble mode to display image and text in a bubble that arrows to a specific point on the screen. This example also shows how important customisation is. Can your dialog boxes be customised by using textures? Anyway, keep up that good work. I really liked that game, because of the changing emotion images of the characters. I'm sure this can be archived by putting more Moan.speak calls with different images. It just so happens that I'm currently working on a Dialogue Panel library specifically meant to work with Möan.lua. To put it simply, I plan to use Möan's excellent dialogue message system combined with my dialogue panels. 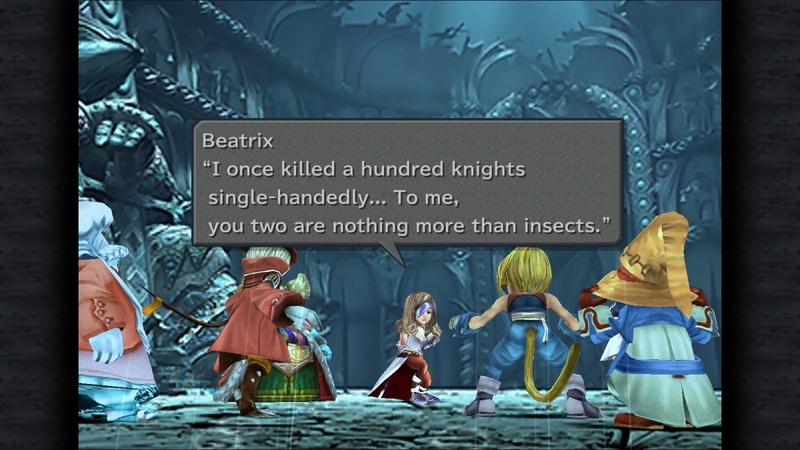 There shouldn't be a problem with supporting multiple character avatars for various emotions, and I'm now working on indicator tails like the Final Fantasy IX screenshot. Looks like I'm going to need to research Stencils. Though this may not work with one of the panel styles I'm supporting. RectPanels are drawn using Love2D's rectangles, have optional borders (and border colors), rounded corners and drop shadow (with shadow color). TilePanels are drawn with a nine-box (3x3) image that defines the corners and sides of the panel. At the moment, Quad bleeding is making it a pain in the arse to scale the center image with a linear filter, so it requires that it be a separate image. The actual border sides are scaled without interpolation. I also still need the option to fill it with a simple rectangle instead of a scaled image, or a tiled image. So that's on the TODO list. FancyPanels make use of RPG Maker's Windowskin format, which is a single tile atlas that defines panel borders, backgrounds, cursors, and more-text indicators. I'm also supporting the construction of complex menu layouts composed of multiple panels. At the moment you can create Fixed size panels and Fitted panels that will size themselves according to their text. I also have handy placement/alignment functions, such as "top left" and "center screen". Every panel has an optional Transition (enter the window from the sides, fade-in, zoom/scale-in, wipe, splits). Fonts are customizable, you can apply drop shadow to text.